The Start from the Beginning Option is the best place to start with Tech Know Quilters and is targeted to students who would like a comprehensive education in EQ8. 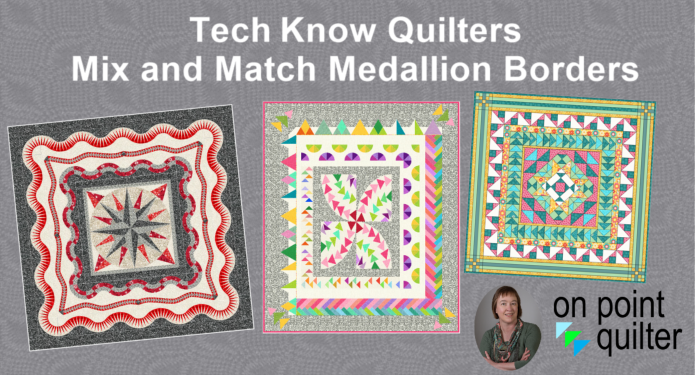 However, if you are comfortable jumping in and wish to focus on the latest releases from On Point Quilter, please purchase the Give Me the Latest Class Option. Month 1: ​Working with Fabric Collections Learn the tricks of using fabric from multiple sources including manufacturer's website, EQ downloads or even photos or scans of your own fabric collections. Month 2: Introduction to EasyDraw Learn to draft your own blocks in EasyDraw using a method similar to working with pencil and graph paper. You will draft over 30 blocks in this class. Month 2 Alternate Class: EasyDraw Kaleidoscopes For those that are comfortable with the basics of drafting in EasyDraw, you have the option of selecting this alternate class to Introduction to EasyDraw. Learn to expand your skill set by drafting a series of Kaleidoscope-like blocks.